Once again: Was Einstein religious? I was also chastised several times by email, and was told that I was guilty of shoddy scholarship. Someone even suggested that I was using a translation I knew was faulty because it met my preconceptions. Well, those accusations are dead wrong. If I’m guilty of anything, it’s only forgetfulness. But let’s look at the translation I posted as well as the original German letter and a different English translation on Richard Dawkins Foundation site (Richard had unsuccessfully bid for the letter on eBay in an earlier auction when it was unsuccessfully offered for $3 million). The entire fracas appears to turn on one word, “childish”, that appears in the Letters of Note Translation but not the one on the Dawkins site. And it’s all about one paragraph. Das Wort Gott ist für mich nichts als Ausdruck und Produkt menschlicher Schwächen, die Bibel eine Sammlung ehrwürdiger aber doch reichlich primitiver Legenden. Keine noch so feinsinnige Auslegung kann (für mich) etwas daran ändern. Diese verfeinerten Auslegungen sind naturgemäss höchst mannigfaltig und haben so gut wie nichts mit dem Urtext zu schaffen. Für mich ist die unverfälschte jüdische Religion wie alle anderen Religionen eine Incarnation des primitiven Aberglaubens. Und das jüdische Volk, zu dem ich gerne gehöre und mit dessen Mentalität ich tief verwachsen bin, hat für mich doch keine andersartige Dignität als alle anderen Völker. Soweit meine Erfahrung reicht ist es auch um nichts besser als andere menschliche Gruppen wenn es auch durch Mangel an Macht gegen die schlimmsten Auswüchse gesichert ist. Sonst kann ich nichts „Auserwähltes“ an ihm wahrnehmen. Here’s the translation I gave from the Letters of Note site (the one I posted); I’ve put the contentious passages are put in bold. The word God is for me nothing more than the expression and product of human weakness, the Bible a collection of honorable, but still purely primitive, legends which are nevertheless pretty childish. No interpretation, no matter how subtle, can change this for me. For me the Jewish religion like all other religions is an incarnation of the most childish superstition. And the Jewish people to whom I gladly belong, and whose thinking I have a deep affinity for, have no different quality for me than all other people. As far as my experience goes, they are also no better than other human groups, although they are protected from the worst cancers by a lack of power. Otherwise I cannot see anything “chosen” about them. The word God is for me nothing more than the expression and product of human weaknesses, the Bible a collection of honourable but still largely primitive legends. No interpretation, however subtle, can change this (for me). These refined interpretations are by nature highly diverse and have hardly anything to do with the original text. For me the unaltered Jewish religion is, like all other religions, an incarnation of primitive superstition. And yet the Jewish people – to whom I gladly belong and with whose mentality I am deeply connected – have no different dignity for me than any other peoples. As far as my experience goes, they aren’t any better than other human groups, although they are protected from the worst excesses by their lack of power. Other than that, I cannot see anything „chosen” about them. I can read German, and the RDF translation is clearly better. And there are two differences between the two English translations. The big one involves the phrase “legends which are nevertheless pretty childish”. That phrase or its equivalent simply doesn’t appear in the original German, which basically says “the Bible a collection of estimable but still mainly primitive legends” (my translation) and stops there. There’s nothing about those legends also being childish. Further, the second sentence in bold says that Judaism is “an incarnation of the most childish superstition”, while the original German says (my translation), “For me the unaltered Jewish religion is, like all other religions, an incarnation of primitive superstition.” Again, the word “childish” doesn’t occur; it’s an erroneous translation of the word “primitive”. So yes, the word “childish” doesn’t belong in a proper translation, and there appears to have been an interpolation of the phrase “legends which are nevertheless pretty childish” in the Letters of Note translation. That may well have been deliberate. But, given this issue, does anything still change? Not really, for even the better translation, and the original German, characterize religion as an incarnation of primitive superstition, the Bible a collection of primitive legends, and God a product of human weakness. Einstein still comes off as an atheist or at best a pantheist whose “god” is the laws of nature. He’s nowhere near being religious in the sense that accommodationists and faith-osculators assert. So let’s put this tempest in a beer stein to rest. Einstein was either an atheist, a non-goddy pantheist, or a very watery Deist whose god was nature itself. He was not religious in any way that religious people would recognize—not unless they want to gather all of us, including atheists, under their wings as having some brand of “religious faith.” At least in his later years, Einstein had given up any idea of the Abrahamic god and the Abrahamic religions. This entry was written by whyevolutionistrue and posted on October 6, 2018 at 11:00 am and filed under Accommodationism. Bookmark the permalink. Follow any comments here with the RSS feed for this post. Both comments and trackbacks are currently closed. Typo aside, you’ve laid this to rest but I wonder how the translator(s) could have thought they’d get away with inserting words that weren’t even there. They think no bilingual readers would ever check? Yeah, it was a typo, and a misleading one. I fixed it, thanks! After died, he understood his huge mistake; too late, by the way. And what, exactly, makes you so sure that there’s a god and/or an afterlife? Please cite convincing evidence for your conviction, or you won’t be allowed to post further (see the Roolz). You are obviously of the view that god is punishing the soul of Einstein for non-belief. A vengeful god. You were awarded a Th.D. [Doctor en Teología] 14 years ago & you will be 60 years of age next year. And that is the best comment you can come up with? I’ve seen the same trolling comment from far less educated & sophisticated evangelical Christians ~ spotty faced kids right up to pensioners, but it seems even the theologians are not immune to walking into the home of an atheist [Jerry Coyne] & farting in his general direction. I’ve added your sentence and attribution to the post above. Thanks! At least in his later years, Einstein had given up any idea of the Abrahamic god and the Abrahamic religions. By his own account he gave up on the Abrahamic religions and anything close to the Abrahamic god at the age of twelve. I sure can identify with that. Well, if for “state” we can substitute churches and indoctrination they’re allowed to pursue. Did he really ever state that he as not an atheist? On at least one occasion he said he was (the Raner letter: “From the viewpoint of a Jesuit priest I am, of course, and have always been an atheist.”). It doesn’t say he was not an atheist, just not an outspoken one. We try much too hard to label individuals as being exclusively in one particular category in re religion especially,as well as other matters, whereas one hopes we learn and grow and change over time as Einstein points out. Were Lincoln, Jefferson, Hitler and Stalin religious? Depends on the perspective of the writer and the period of time they focus on. Even when we write in the same language as the person we’re quoting, we are interpreting and translating. 2. One of my English Literature professors (jokingly?) told me that we only need 200 books that we reread every five years. We will have forgotten much of what we read previously, and we will have changed enough to learn something new each time. Not to mention the ongoing cultural changes we live in. Very interesting quality post thank you Rowena! New ‘literature’ pops up all the time, most of it is rightly forgotten within a decade, but perhaps there’s three books a year in English worldwide [wild, wild guess & possible an overestimate] that will still be read in one hundred years – the classics to be. It would be a shame to miss out entirely on the mere 200 or so books worth reading that arise sparkling new in ones lifetime. It is fun to watch the evolution of a writer over her life – does one read ONLY her two great books & dispense with the eighteen also rans? I’m not normally a user of the term ‘literature’ because it’s then a oneupmanship battle – to promote ones own view of what is in the canon & what should be discarded as only a passing fad. BOOKS are more varied in their styles & presentations than ever before with more of the common people embarking on writing, plus the use of multimedia [audio, graphics, gifs] – it would be a great shame to be stuck in amber & miss out on graphic novels or electronic novels purposefully designed only to be listened to. And presumably your Lit. Prof. has missed out on the Silver Surfer & other ‘comic’ creations. The letter is scathing in German, and the new translation is even a tad mild, e.g. “largely primitive legends” isn’t correct. It should be “profusely primitive legends” or “abundantly primitive legends” for example, from reichlich, “richly”. I agree, the translation with “largely primitive legends” diminishes the sharpeness of Einsteins words, “abundantly” or profusely” would be more proper. It fits very well for me as a native German with good (but not extraordinary) English proficiency. Proof that I am getting there? I don’t say “motherfucking religion!” as often as I used to. And, Happy Thanksgiving to all us Canadians on this site. Oh, and Happy Birthday to me, on the 8th, wherin the whole nation gives thanks for my birth. Cool! Felicitations on the day of your birth. The definition of a myth, according to Joseph Campbell, is that “(it) is an organization of symbols, images and narratives that are metaphorical of the possibilities of human experience and fulfillment in a given society at a given time.” I read Einstein’s letter to think that he was, if nothing else, a mythologist. No mention of god or an afterlife. What does the thing he didn’t say have to do with what he does or doesn’t believe/know..? Assuming fishnet’s quote is complete, then – like the dog that didn’t bark in the night – it’s reasonable to draw an inference that Einstein’s thoughts were not drawn to religion. (Because in similar circumstances most people who believe in God do mention it). I’m interested to know why the gross assumption has been made that Einstein doesn’t believe/know there was a God–creative force or energy beyond the observable and material world we know. Einstein said time and time again that the views of most religious traditions were childish (and it’s pretty obvious they are, at least on the literal level). But one thing has nothing to do with the other, nor is it a negation of complete belief or direct experience of the creator energy itself (sometimes called “God”) by Einstein. 2) he does not believe, think, or know of any PERSONAL god. 1) He does not believe/know that there is an IMPERSONAL god or creative force that birthed all things. It is clear that he used the adjective “personal” for a distinct purpose. Case in point, the modern spiritual teacher Eckhart Tolle also plainly states that he does not use the word “God” because it has been misused. And yet, Eckhart Tolle speaks of the collective consciousness and force of creation that is beyond the form, beyond the material realm of existence. This is the same point Einstein is writing about in this letter. The spiritual teacher who got extremely wealthy through teaching spirituality & still charges a healthy sum for books & appearances? That man is a hypocrite & not a good measure to stand up alongside Einstein! Finally Einstein allowed himself what he called religious feelings – he was very free about throwing the word “religious” about to describe himself – it was the best word he knew [so he claimed] for that “awe” at nature & its ordering that we all experience to some degree or other. I haven’t “decided” on what Einstein’s view was. I simply pointed out that Einstein was making a point that the dogmatic “God” as promoted by the various religious orders is not, from his perspective, a reality. Read my post again. I used the fact of Eckhart Tolle to explain that someone with stated direct knowledge of a personal God still does not use the term because it is improperly applied, from his perspective. You have expressed several assumptions that cannot be factually substantiated. You even say yourself that Einstein never made claims about the creator you say he “believed” in. How would you know this? (Inference doesn’t count…that was the purpose of my comment). Your first para in your reply to me: mentioning the conman Tolle was unnecessary & muddied your meaning. It is simple enough to be clearer than you were & you succeeded in your reply to me. To repeat myself: The creator he “believed” in ranged from a set of laws [no purposeful guiding intelligence] on upwards to something ungraspable today to us. Einstein identified only a few properties of that god & was not prepared to say much beyond commenting on the resultant beauty & order. I am not making assumptions on the above, it is clear from his English remarks in letters & collected writings that he remained non-committed to one particular view of god’s nature – because of the unknowns caused by insufficient data & the limitations of our intellect. Conman. Huh. Again, you missed the reason I made the statement. …and you just repeated a bunch of assumptions. You don’t have any direct statements from Einstein to back up any of the claims of what he did or did not believe. Have a nice day. And when you say “something ungraspable to us,” it would be better if you spoke for yourself. You assume I haven’t had my own direct experience which is a gross assumption, indeed. “Because of the unknowns by insufficient data,” it’s quite ironic and a bit funny that you make such a contradictory statement…you assume the logic for Einstein’s view of god and you assume the view itself. And then the logic you assumed Einstein implemented (because of our limited understanding, paraphrased) invalidates your argument. What a circle of fallacies. Assumptions and judgments…they’ll get you every time. Oh, you’re back. Since you didn’t mention your “direct experience” before your most recent comment I assumed you were writing about Einstein only & not also your vision, insight [or whatever it was] that you haven’t as yet outlined. That is shifting the goalposts somewhat – throwing in your information-free special knowledge grenade that’s less than even an anecdote. As a German, I thank you for this comparison. The RDF translation seems very good to my far-from-perfect knowledge of English, especially since the original text is written in an academic and slightly archaic German (e.g. I don’t remember hearing someone use “Dignität” in my almost 50 years of life). I also concur that the differences don’t change their assertion on Einstein’s views in any significant way. Nevertheless, I am happy about any effort for good translations, since there are too many bad ones throughout the world. I suppose we are going to ignore that he was willing to use a translation from Richard Dawkins’ website, the site of a man that was claimed by many to be guilty of hate crimes for what he said and was in no sense of the word of being unbiased in what he stood for (as there are many examples of such in which he clearly admitted many times in public). If you are going to use sources to post an opinion then credit them to scientific unbiased ones that have no vested interest or vendetta against either side (which is clearly not the case here). Otherwise, it shows a lack of professionalism and a vested interest in your opinion (especially with all of the other quotes in context being portrayed in the bigger picture). 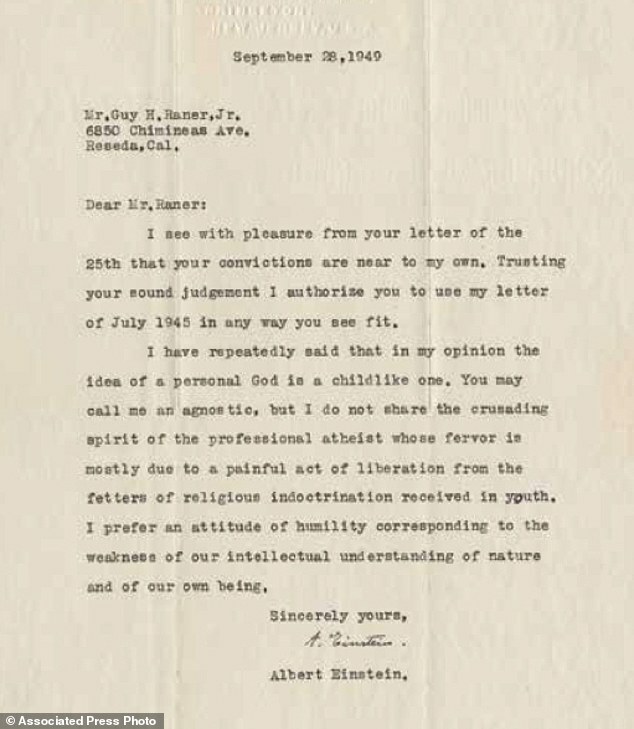 As for Einstein, he was considered agnostic or religious (depending on when we are talking about) but he never attributed himself as atheist which is quite clear by his other comments and letters in consideration. Personally, I find it rather foolish to put so much value on it as it is his opinion and does not offer anything concrete either way for anybody to be so concerned of what they did or did not believe in. Personally, I find you not “rather” foolish, but EXTREMELY foolish. Rejecting a translation solely because it was put on Dawkins’s website? Dawkins guilty of “hate crimes”? Man, you are a piece of work. Please provide examples of those alleged “hate crimes”. Was that ‘hate crime’ or ‘thoughtcrime’ by the way? “was in no sense of the word of being unbiased in what he stood for” Oh, what a surprise. Show me any public figure who is [unbiased]. Your obsessive hatred of Richard Dawkins is showing. By your logic, it would be practically impossible to quote anything from any source, since every source has been impugned by some nutter or other. I’d better stop before I break Rule 8.